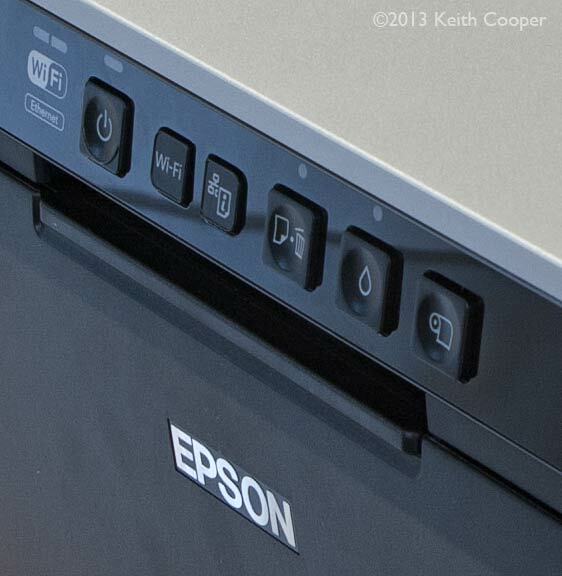 The Epson R2000 is a pigment ink based printer, using Epson’s Hi-Gloss 2 ink set. 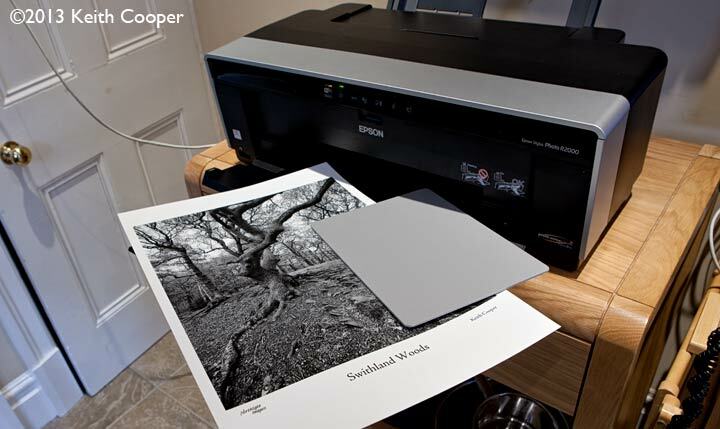 Epson UK kindly lent us a printer for a while, to try out and test. 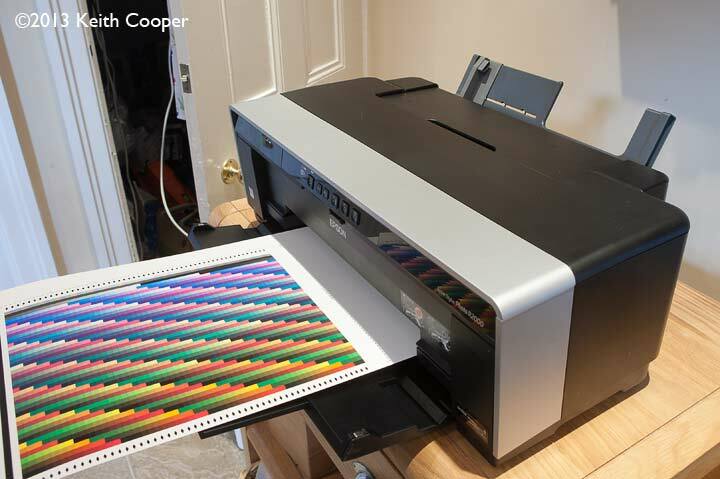 Keith Cooper has been looking at how it performs as a photographic printer, for both colour and black and white printing. 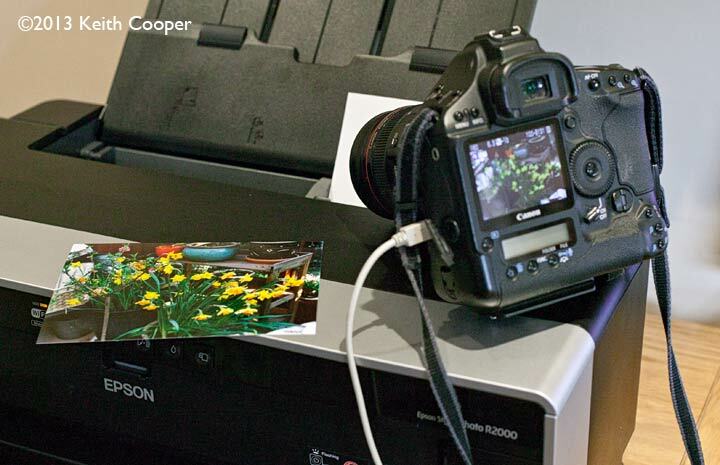 Most of this review looks at an Epson R2000 driven directly from Photoshop and using an Apple Mac. Functionality is very similar if you were using a Windows PC. What do you get with the R2000? The R3000 I tested was shipped already set-up, so I was able to get it going fairly quickly. 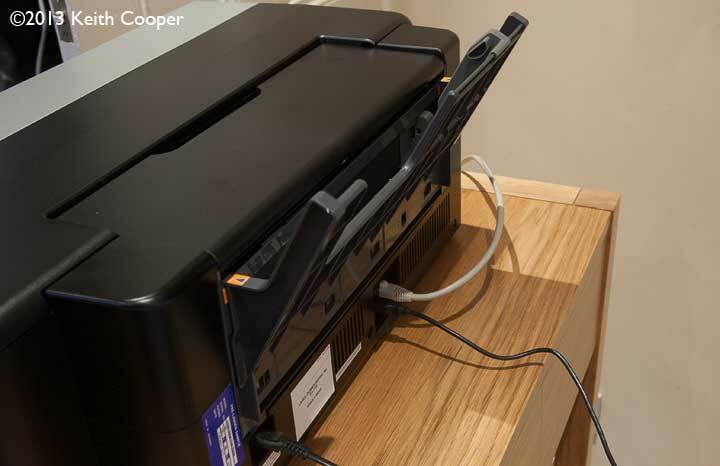 A new printer needs all the ink cartridges installing first – you can see them stacked up on the printer below. 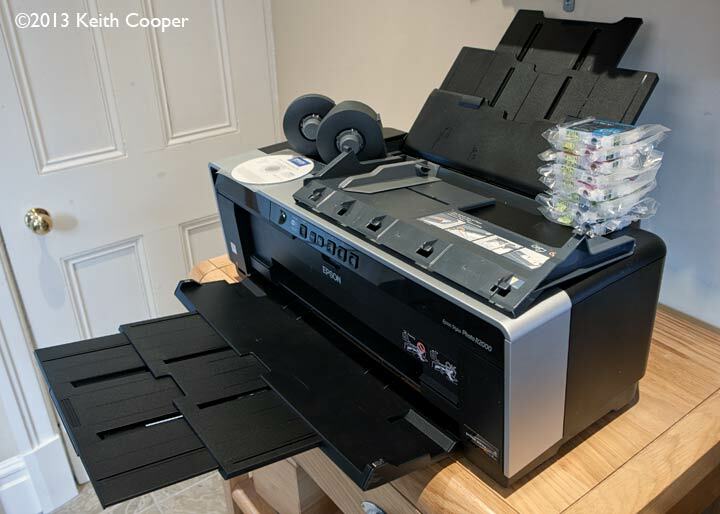 Our test printer lacked the CD print tray, so I wasn’t able to test this, but previous testing of the R3000 and other Epson printers suggest that they have CD printing pretty well accounted for. 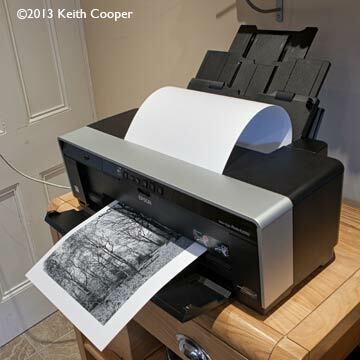 Note the presence of only basic black ink (type used depends on paper type) – this suggested that the R2000 might not be a printer for those wanting to experiment with monochrome. Fortunately, as I’ll show, I was to be pleasantly surprised by what you could get from this printer. 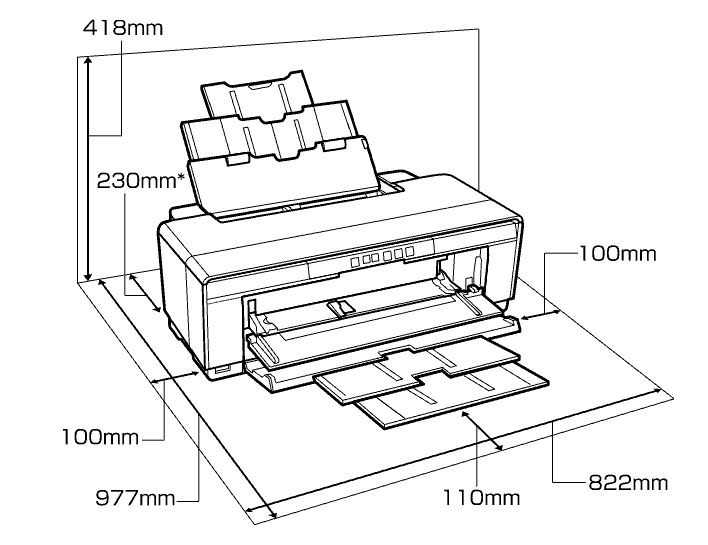 The printer is relatively light, compared to some of those of similar size I’ve looked at of late. It’s easy to move around, even if you’re not particularly strong. The printer was easy to find on our network. I’m always a bit wary of connecting up test printers, since I’ve no idea how they were set up by previous users. Initially installing the software on my laptop (USB connection) made for very simple configuration. Unlike the bigger R3000, which has an LCD display screen, you do need a direct connection to easily set up wireless functionality. 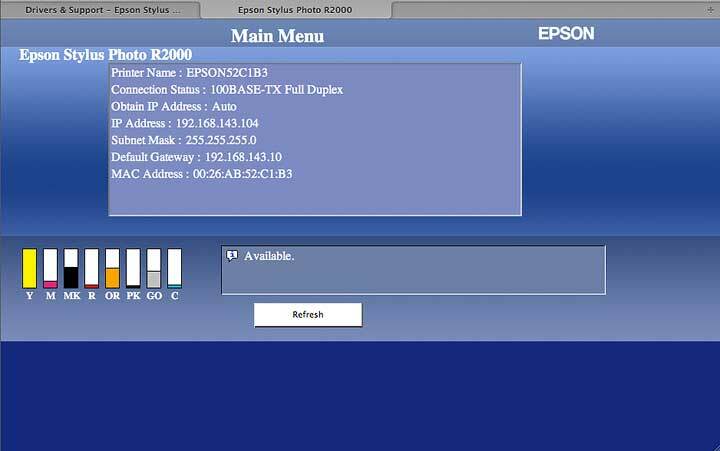 Once the printer is set up, it has a web page of its own, accessible from any browser on your network. 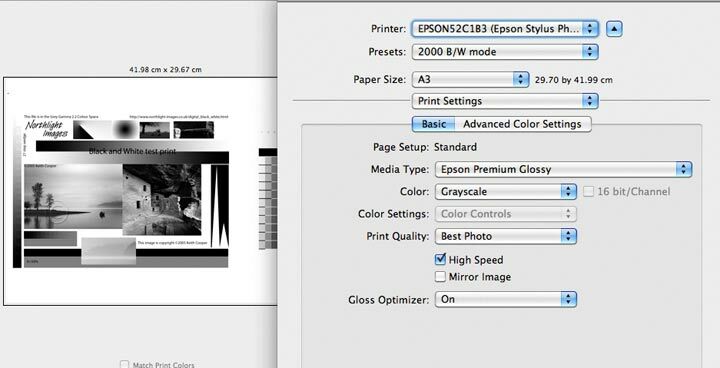 You can also print directly from devices such as an iPad with software produced by Epson. Move your mouse over the image to see the various paper trays. Here are the more detailed space requirements. Do note that if you are loading stiff media from the front, it does need to come out all the way from the back. 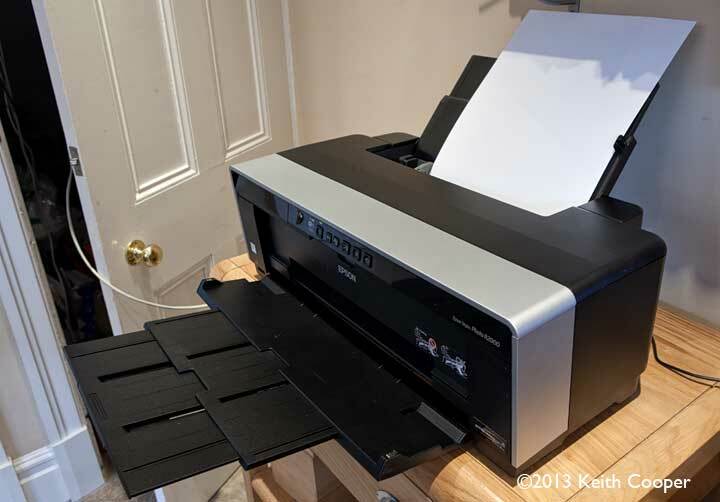 The only controls are on the front panel – for most users of the printer you won’t usually need any more than the power button and the ink button – to dismiss initial ink warnings and to change ink when you absolutely need to. 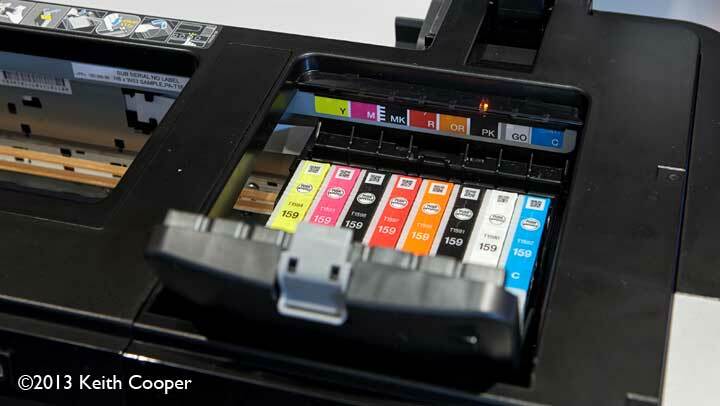 Like many inkjet printers, waiting until you absolutely have to change inks will. 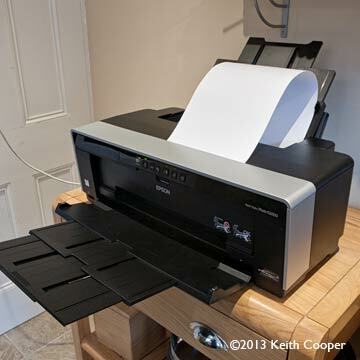 over the lifetime of the printer, save you quite a bit of cash. Use the initial low ink warnings as a reminder to have spares ready. 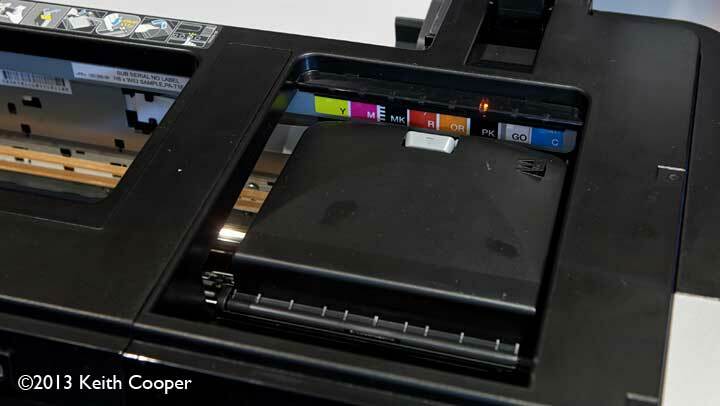 The ink carts are installed and replaced by lifting the top panel of the printer, when the printhead/cartridge assembly can be moved to its access position. Move your mouse over the image to see the cartridges. The cartridges simply plug in. They are a good snug fit (mouse over image to see) and firmly click into place. When I get printers shipped to me to test, I always like to leave them overnight to settle. This one was in good condition, but an initial nozzle test showed a few colours not quite working correctly, so I ran the automatic cleaning process. After this, the printer worked flawlessly for the many dozens of prints I produced. After this clean, a few test prints, and several profiling targets, ink levels had dropped enough for me to need to change the black ink (the one shown in the pictures above. 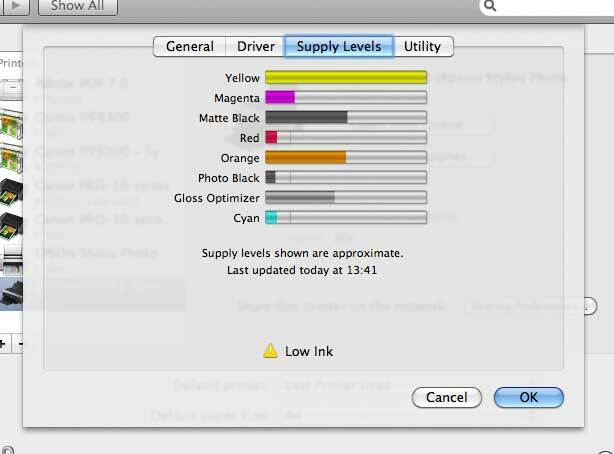 Mouse over the image below to see the movement in ink levels – the indicators show small movements well enough to give a real feel for your ongoing ink usage. 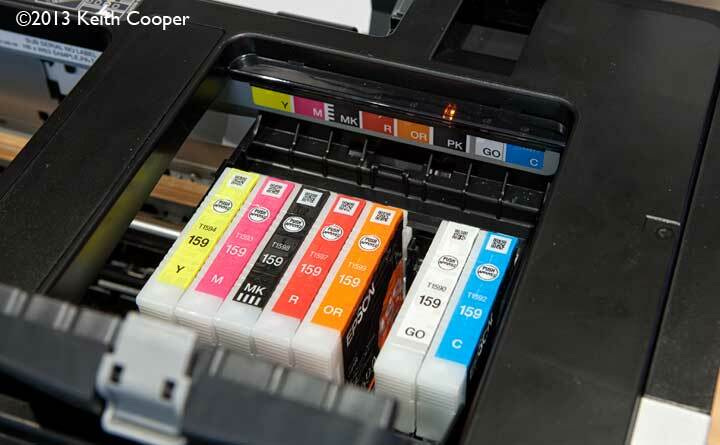 The ink cartridges will be shaken every so often, in a feature called ‘ink density optimisation’ – most pigment ink printers do this every so often to counteract a tendency for pigments to settle out over time. Like all inkjet printers, the R2000 benefits from regular use – leaving any printer several weeks between prints makes it more likely that you will need to run cleaning cycles, especially if you live in a climate with low humidity. 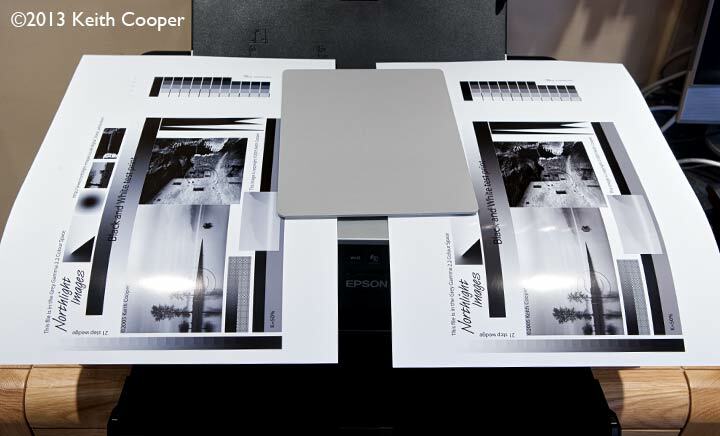 If you have experience with one of Epson’s earlier A3+ printers then you’ll know that you have to use different black inks for matte and glossy/lustre papers. 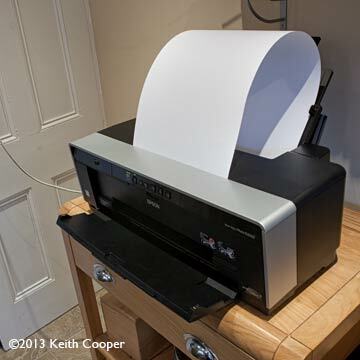 Well, the R2000 has both Mk and Pk inks loaded at the same time, so no more swapping/waste of black ink – a vast improvement on printers like the R2880 if, like me, you enjoy printing on a variety of paper types. 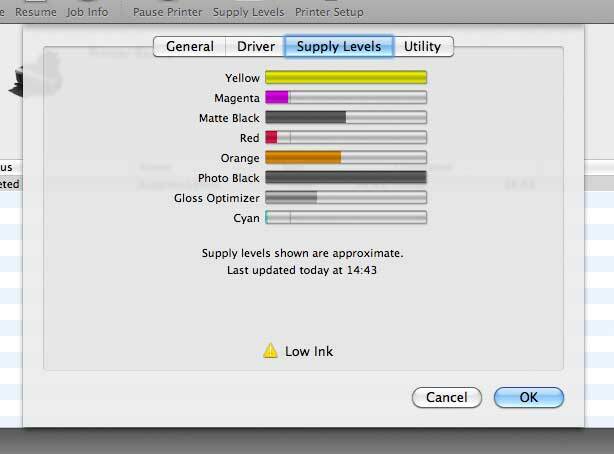 Print utility and driver options allow you to set various alerts and monitor status. 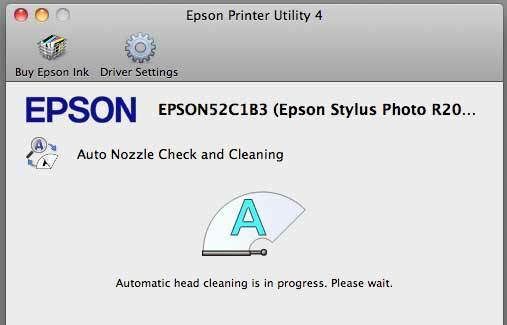 If nothing happens when printing, do go back to your computer and look for the warning/error message. 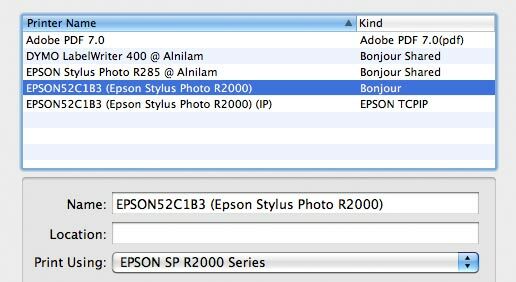 Printing on an A3+ sheet of Epson’s very nice ‘Cold Press natural’ art paper (rear feed slot) I checked to see the margins required. As you can see (mouse over image), no problems with margins (3mm) on normal ‘art papers’. I note that for thicker papers, whilst you can print at top and bottom of the page, there is a 35mm area where ‘quality may be reduced’. For single sheet printing I detected no issues, but as you can see, the sheets are very flat, with no curl. 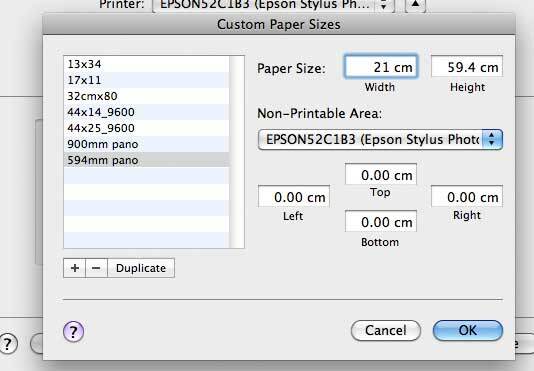 If you are printing borderless or with any paper at the top and bottom of the page, then do check carefully. It’s my experience that printers really don’t like paper curl at the beginnings and ends of prints. The manual has details of all the various options for borderless and roll printing, and is well worth reading carefully if you want to go beyond the ‘standard’ print types. Here’s an A3 sheet (a lustre paper) printed (mouse over image to see). Here’s an A3+ sheet of a heavy cotton rag paper printed via the rear loading slot (mouse over image to see). As with most printers, I initially had some minor issues about how hard to push the paper into place, but once I’d got the knack, it was pretty easy to load. 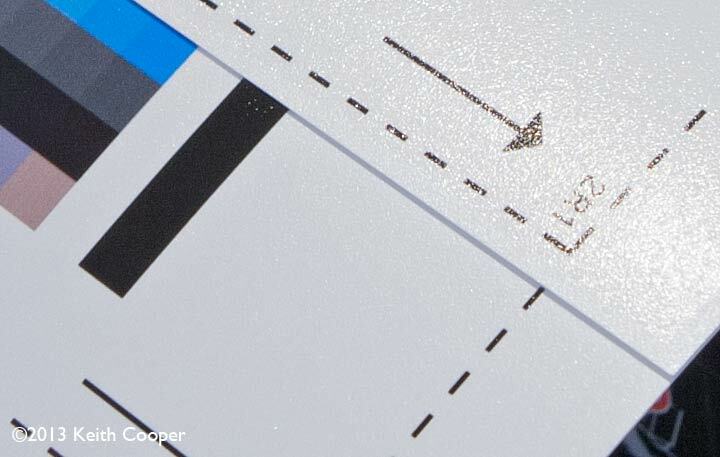 The printer handles media up to 1.3mm thick and has a front loading straight through print path – you need to lower the front panel (also used for CD printing). I’m trying a special panoramic paper size here from Paper Spectrum (based near where I live in Leicester in the UK). The version I’m using here is just a basic white matte photo paper. It’s actually very easy to set up to feed. 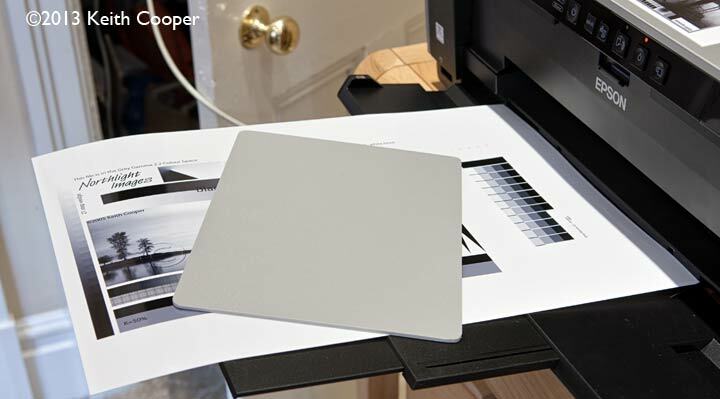 I like this paper size for panoramic images – it has the advantage of being flat. Curl is often a problem with small 13″ rolls of paper, particularly near the end of the roll. This time on a glossy photo paper. Once again, no problems with paper feeding. 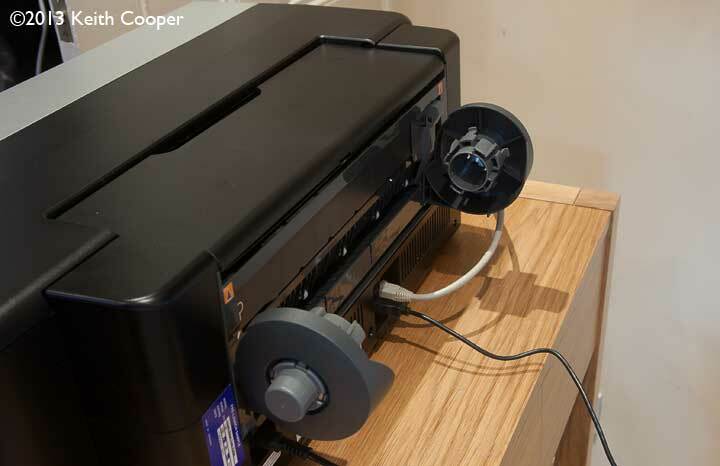 If you take the rear feed unit off the printer, you can fit the roll paper holders (mouse over image to see). Unfortunately I was out of roll paper this size, so unable to test it. 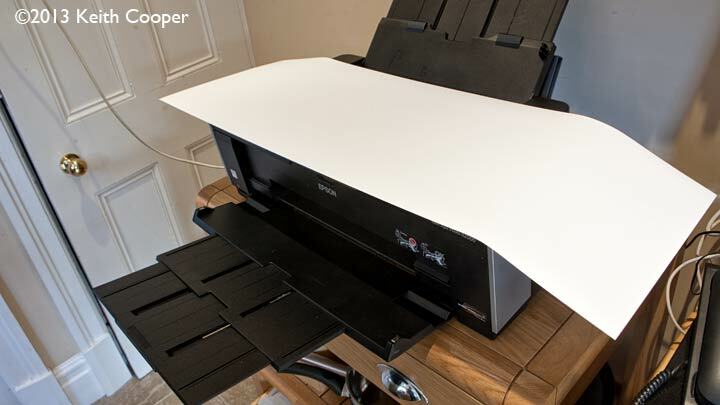 However I did get to try this with our R3000 review a while ago, which discusses roll paper use with this size of printer in much more detail. 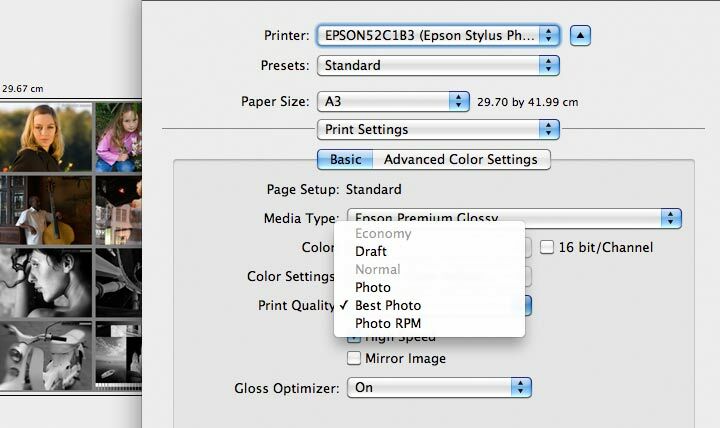 The printer can print to 129″ (3.27m) in banner mode – enough for most people’s panoramic print needs. 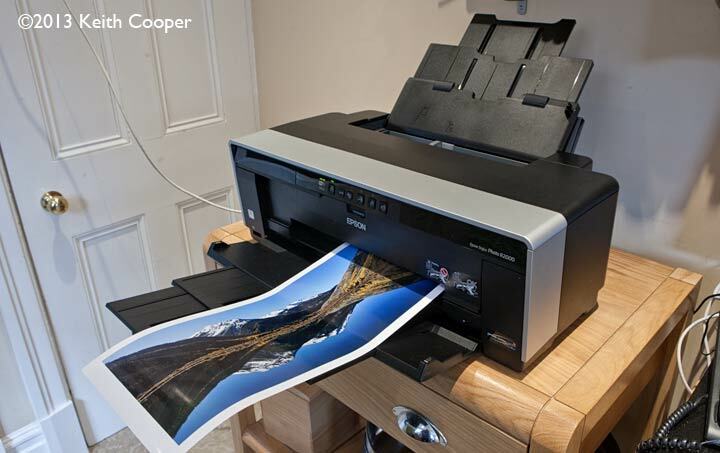 I’m assuming that most people wanting a printer like this want to make prints to display, and that these prints are likely to be viewed at a reasonable distance. Why so? Well, modern printers with good paper and well made profiles are capable of producing stunning prints. Indeed, unless I’m putting prints next to each other under controlled viewing lighting, very few people could tell the difference between most images printed on different (good) printers on the same paper. 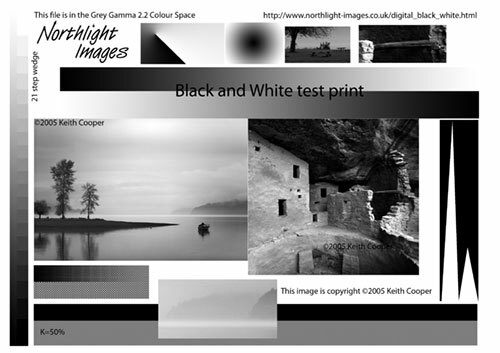 For looking at colour and black and white performance, I’ve initially used a Datacolor test image for colour, and my own black and white printer test image. I know both images well enough to spot any problems with a new paper (my most common use for them). I also use both for testing the performance of printer profiles. If you make use of them, then do be sure to read the explanatory notes that go with them. When trying out different papers, one additional option in setup, is whether to make use of the ‘Gloss Optimiser’ clear coating ‘ink’. With Epson papers, this will have been set in advance, but you might wish to experiment when looking at lustre or semi-gloss finishes. The example below show the change in surface finish, and how the coating doesn’t quite go to the edge for the particular paper size I’m using. It’s taken quite some effort to make the differences as visible as they are in this photo – it’s normally a lot more subtle, but for a paper like Epson Premium Glossy Photo, the results made me think I was using a dye based printer. There is a bit of a downside in that you can use up the gloss coating at a fair rate with big glossy prints (I note that the R2000 has been supplied with two gloss carts in some markets – ours was not new, so I couldn’t say whether this is still so). I prefer to create my own colour profiles for papers and printers I’m testing, using i1Profiler from X-rite and an i1 iSis scanning spectrophotometer. 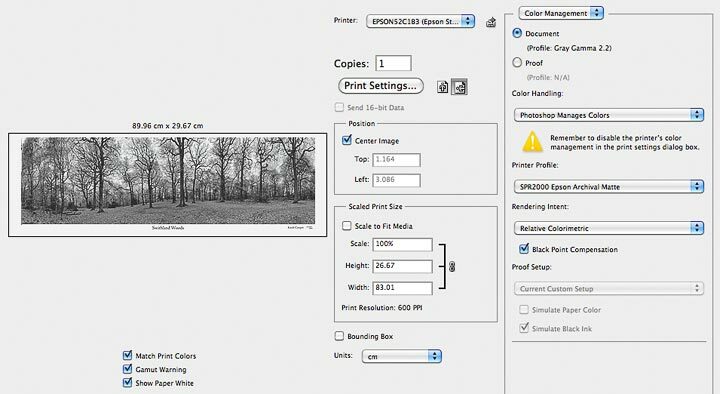 The printer software installs a good set of profiles for Epson papers, which gave generally good results. I tested the premium glossy (PGPP) and lustre, along with the velvet fine art. 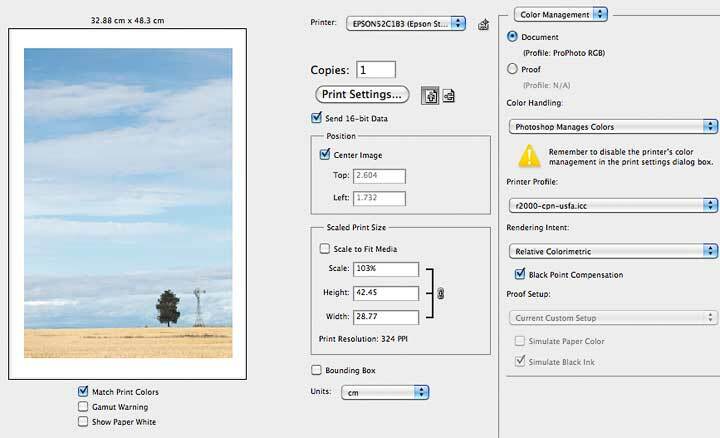 Best photo was the setting I prefer to use for printing with this printer – PhotoRPM didn’t produce any noticeable difference in any image I tested (on PGPP), other than slow down printing. 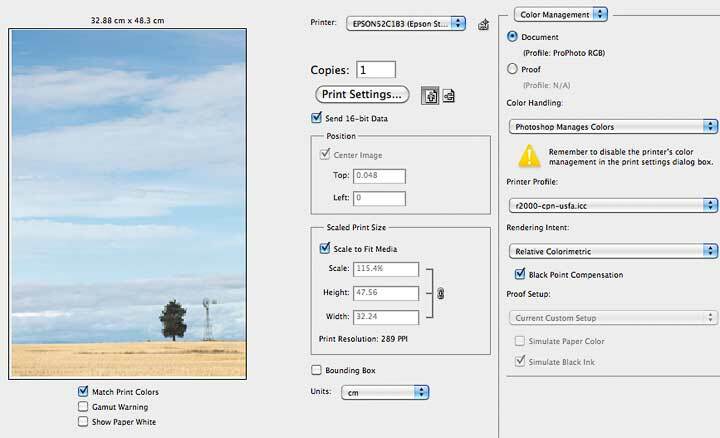 I used 16 bit mode where images were in 16 bit, and a larger colour space (such as ProPhoto) although once again, the benefits are unlikely to show on many prints. The printer has a greyscale print mode. However, with just the one black ink, I wasn’t expecting great things in this area. 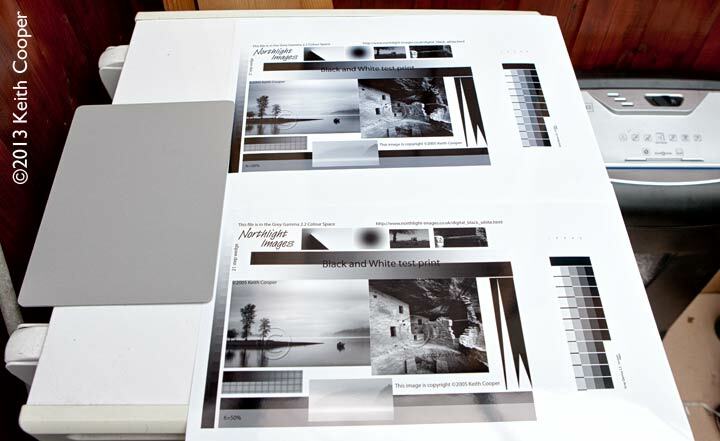 The photo below shows an extremely accurate photographic grey card over a test print produced using the greyscale mode. This is viewed under halogen lighting, and white balanced for the card – the colour cast to the print is quite noticeable. However, look at the two prints below. The left hand one is the same, but the right hand print is printed with a colour ICC profile I’ve made for the paper. The colour cast is much reduced, and the linearity of the print has been improved. Moving outside (grey overcast day) shows the difference very clearly – with the greyscale mode print looking distinctly blue for my taste. Once again, the image has been white balanced to the card. Similarly, a profile I created for Epson’s Cold Press Natural paper (no brighteners) produces an excellent monochrome print. My suspicion is that if when building the profile (from nearly 3000 patches) I’d set the illuminant to a bit lower temperature, the print would look almost bang on neutral. In terms of print quality, this is one of the best unexpected results I’ve seen for years. I’ve taken this print, and one of the same image produced on a printer with multiple black inks (greys) along to several talks I’ve given of late, and without controlled lighting and very careful comparison, very few people noticed any difference. The difference is there, but at a level that I’m now happy to recommend this printer as capable of producing good B&W prints. 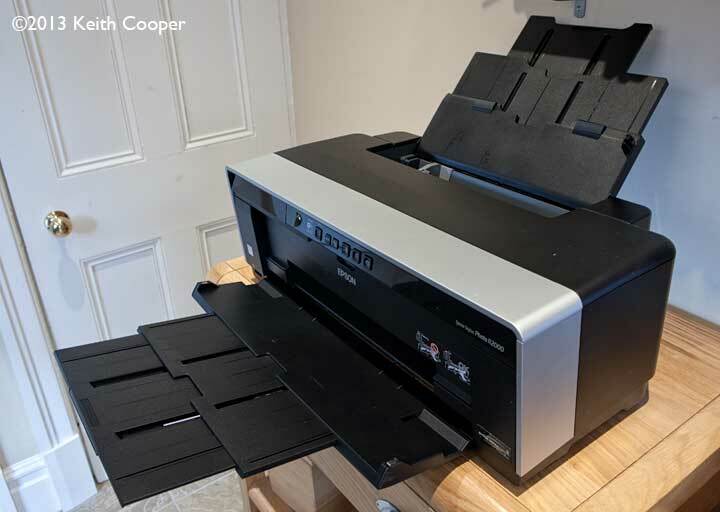 Of course, I’d prefer the additional flexibility and control you get with the R3000, not to mention the bigger ink cartridges and multiple black inks, but that comes at a price you might not want to reach. For the first time ever, I tried out the PictBridge USB socket at the front. I’ve loaded a pack of 7×5 glossy paper (PGPP) and taken a photo of the daffodils in our conservatory. 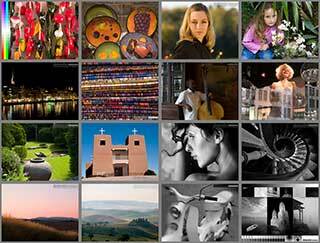 Plugging the lead into the camera (a 21MP Canon 1Ds3) I’ve selected (and slightly cropped) the image I want. It was then printed directly from the camera. The print looks like a standard photo print from a shop – borderless, pin sharp, smoothly glossy. 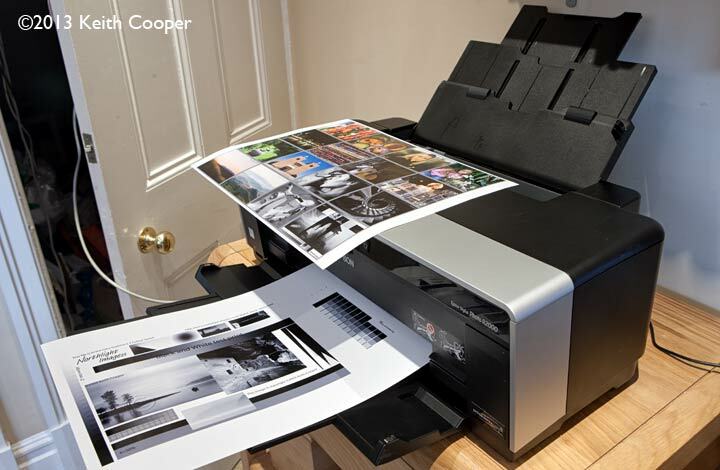 A printer that just works – and produces exceedingly good quality prints. Simple to set up and easy to use. We make a specific point of not selling hardware, but if you found the review of help please consider buying the R2000, or any other items at all, via our link with Amazon. 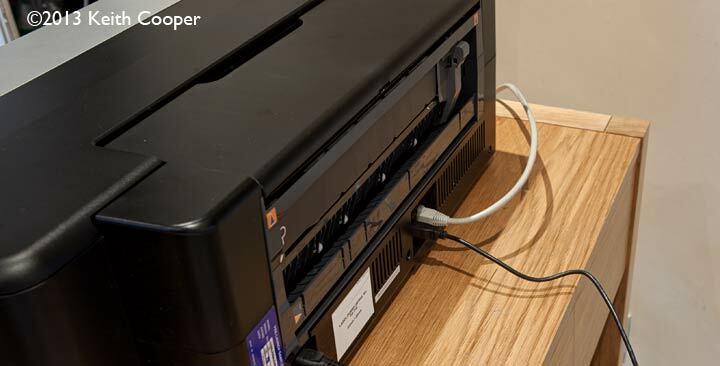 The range of connectivity makes it easy to share the printer between users. 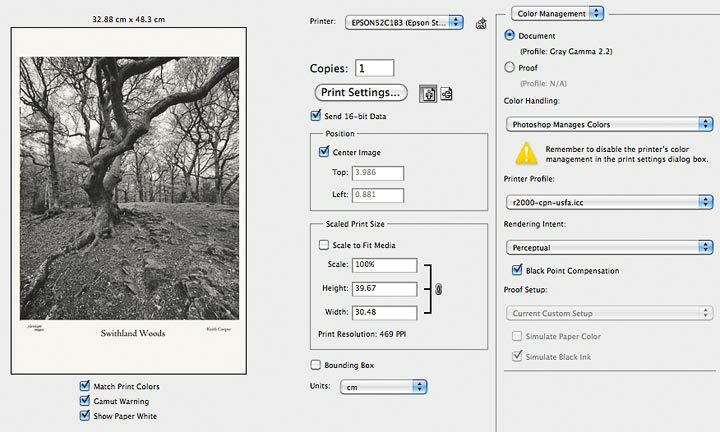 Black and white printing performance is so-so with the greyscale print mode but, with a well made custom ICC profile, can produce results that were of truly unexpected quality. 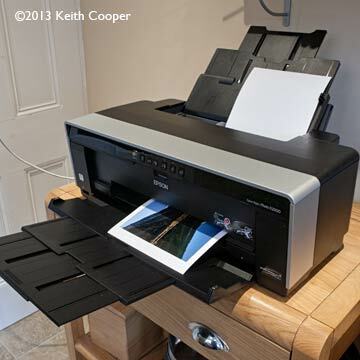 The colour range of the R2000 is very good, comparing favourably with much larger printers. 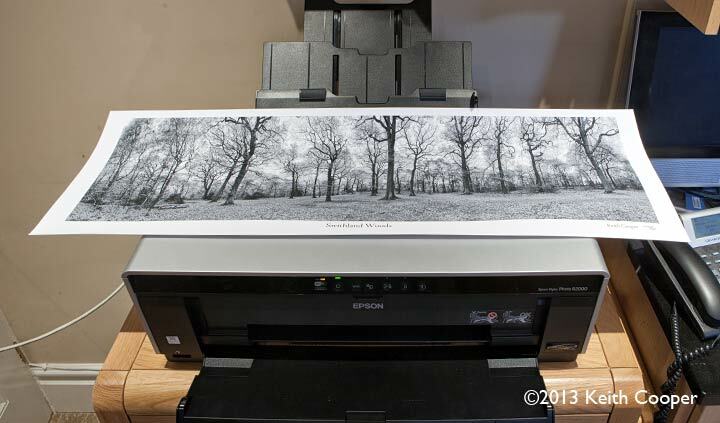 Sure, I can see some difference compared to the Epson 4900, but the differences really won’t be obvious to many. Compared to the smaller cartridges of the previous R1900 (17ml in the R2000 vs. ~11.4ml) the R2000 should prove more economical to run. 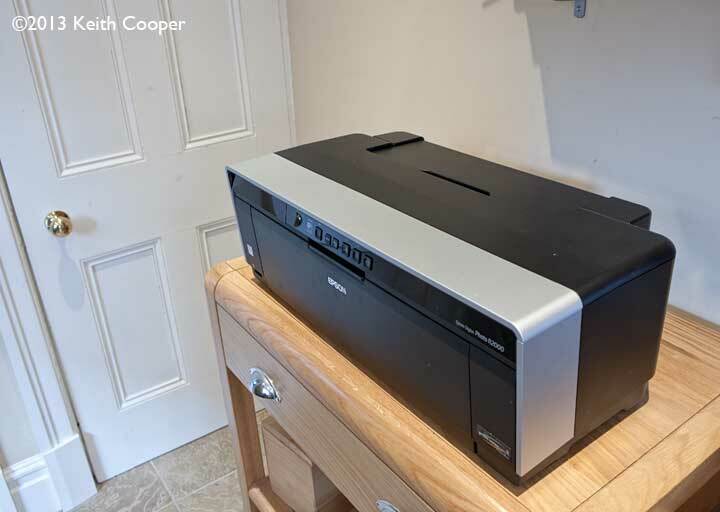 Ink cartridge size is good, but then again, this isn’t a printer you’d choose for high volume printmaking in a business. With limited spare inks and trying lots of different papers and settings, it’s difficult to give meaningful data on ink usage from my testing, but apart from the relatively rapid use of the gloss coat, I was pleased at the big stack of test prints sitting in the office at the end of testing. 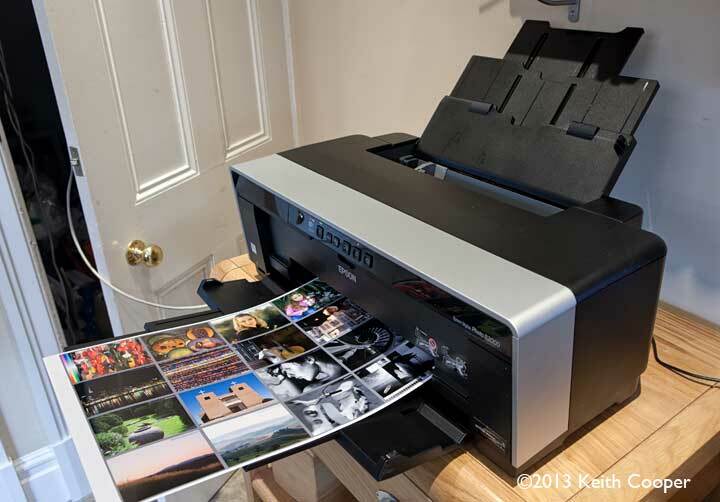 A really high quality printer that will well serve the ‘enthusiast’ market. 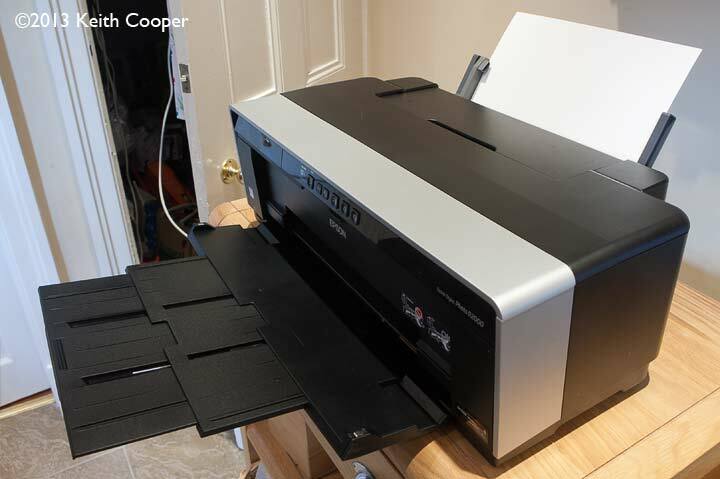 As one of the cheapest printers I’ve seriously tested for several years, I was mightily impressed, and find it difficult to point to any meaningful issues or problems.